INOX has announced Buy 1 Get 1 offer for its customers along with ICICI Bank. The offer is available in all INOX movies located in different cities like Chennai, Bangalore, Delhi, Kolkata, Mumbai. How to avail INOX ICICI Buy 1 Get 1 offer? 1.Visit www.inoxmovies.com website, mobile app or mobile website. 2. Go through the regular ticket booking process. Select the city, movie, cinema, show date, show time and seats of your choice. 3. Confirm details by providing your e-mail Id and mobile number. Confirm your transaction through e-mail and SMS respectively. 4. Go to the Order Summary Page and select “ICICI Bank Buy 1 Get 1” offer from Discounts & Offers option. 5. Enter the required details in the box and click on “Apply” button to avail Buy 1 Get 1 Offer Inox discount in association with ICICI Bank. 6. Please check the tick box which states “I accept offer Terms & Conditions and INOX booking policy”. 7. Fill in the rest of your details as mentioned on payment page to proceed with your transaction with INOX Buy 1 Get 1 Offer. This INOX ICICI Bank offer is valid till 31st March 2016. 1. Only one free ticket can be availed per ICICI debit card per month. 2. The value of free ticket cannot exceed Rs.250. Additional amount has to be borne by the user. 3. Discount is applicable only on ticket price. Convenience fee is levied on each ticket (as applicable). 4. 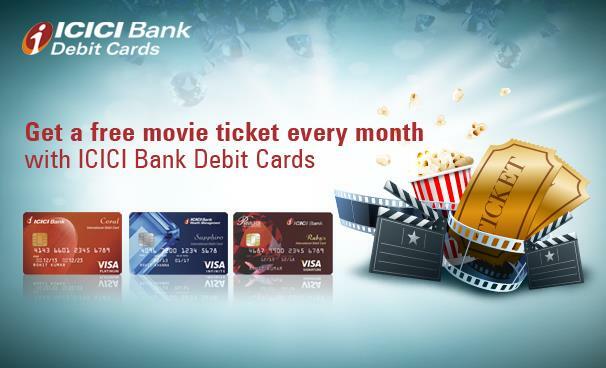 User has to use ICICI Bank Coral, Rubyx, Sapphiro or Expressions Coral Debit Card to avail the offer. 5. Users will need to buy movie tickets through www.inoxmovies.com to avail offer on tickets purchased. 6. INOX Buy 1 Get 1 offer is not valid at INOX Box office. 7. INOX Buy 1 Get 1 Offer is valid only for customers coming directly on www.inoxmovies.com and not via any other website. 8. Please send your queries to contact@inoxmovies.com if discount has not been processed. 9. This offer cannot be combined with any offer / discounts / promotions available on www.inoxmovies.com. 10. Movie tickets are subject to availability at the respective INOX cinema. 11. Tickets once bought online, shall be considered sold and cannot be cancelled, refunded or exchanged in any form whatsoever. 12. Once the booking is completed, the confirmation e-mail / SMS received from www.inoxmovies.com needs to be exchanged with cinema representative at Box Office or pick up from kiosk. 13. The current purchase process of tickets at www.inoxmovies.com will remain unchanged till the time where the user opts in for “ICICI Bank Buy 1 Get 1”. After this stage the website will recognize the user and Offer related to the same and reduce the bill amount and inform the transacting user accordingly. 14. In case you have applied for the “ICICI Bank Buy 1 Get 1” offer, but the transaction doesn't go through for some reason, kindly wait for 20 minutes before re-trying to avail the discount again. “ICICI Bank Buy 1 Get 1” offer is applicable on all INOX cinemas in India for which tickets can be booked through www.inoxmovies.com. 15. Read more terms and conditions by INOX here.